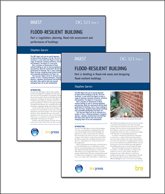 This BRE Digest sets out an overall approach to building in flood-risk areas and the design of flood-resilient buildings, using a range of measures, including elements of resistance, resilience and avoidance. The approach is based on that which has been developed in all parts of the UK in recent years. It will be of relevance to developers, designers, planners, regulators and others who need to take into account managing flood risk to new development. The Digest is in two parts. The first part gives the background to building in flood-risk areas, and covers legislation, the principles of flood-risk assessment and the issues that define flood performance of buildings. It draws on the growing literature in this field to promote good practice and encourages responsible development that considers flood risk and addresses appropriate design and construction solutions. 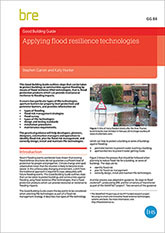 The second part covers designing flood-resilient buildings, and sustainable development and flood risk, and describes features and measures that can be used to protect buildings. A4 24pp, 6 diagrams, 1 photo. Available on or after 27/1/2012.